The Nintendo DS system hit store shelves across North America exactly 10 years ago today, on Nov. 21, 2004. Its Japanese release followed on Dec. 2 of the same year, while it didn't arrive on Australian or European shores until Feb. 24 and March 11 of 2005, respectively. Although I now consider the DS to be one of my all-time favorite systems (along with, say, the Famicom, the PC Engine and the GameBoy), it took some time for it to worm its way into my heart. What can I say? Aside from its dual-screened design, I wasn't all that impressed with the system or its initial selection of games following its early-2004 reveal. A stack of some of my favorite Japanese DS games. Do any of you also consider yourselves to be DS fanpersons? If so, please share some of your most cherished memories of this unique system in the comments section below. It's no secret that I love so-called Bubble Bobble clones. As such, I guess it shouldn't be much of a surprise to hear that I'm feeling a bit gaga about the game, called Drop Wizard, showcased in the trailer below. I mean, it's got an adorable, cherubic protagonist, similarly aww-inspiring enemies and all kinds of collectible fruit--how could I not go a bit gaga over it? And then there's the cherry on top: its gameplay looks to include elements of one of my favorite Bubble Bobble clones, Snow Bros. The only downside I can see to Drop Wizard at the moment is that the levels shown in this trailer seem a bit sparse--although that may be due to it being an iOS game? Actually, it being an iOS game is another downside, if I'm to be honest. That's not me ripping on iOS game, mind you; it's me whining about the fact that I can't play this particular one because I don't own an iOS device. Developers Neutronized suggest in the comments section of the trailer above that they'd like to follow up the initial iOS release with Android, PC, PS3/4/Vita, Wii U and 3DS versions, though, so here's hoping they're able to make that dream a reality sometime soon. Does the impending North American release of Brandish: The Dark Revenant (PSP) mean I can continue to dream of a similar localization of MonHun Diary: Poka Poka Airu Village? OK, so we all know that isn't going to happen. MonHun Diary: Poka Poka Airu Village finally getting a North American release, I mean. I can't help but wonder, though, if some adventurous company--you know, like Xseed Games, for instance--would have brought it out here if it weren't a Capcom property. Oh, well, why bother fretting over that when games like Brandish: The Dark Revenant actually are coming to our shores, and likely before the calendar flips over to 2015? Unfortunately, Brandish: The Dark Revenant's impending North American release will be of the digital-only variety (something that's likely to limit buyers to Vita owners, I believe), but it's kind of hard to fault publisher Xseed Games for going that route in this day and age. Anyway, to learn more about this curious-looking, Nihon Falcom-made dungeon-crawler, check out the trailer above (yes, the Japanese version actually came out all the way back in 2009) or the rather cool "localization blog" that was published on Xseed's Tumblr last week. P.S. I'm pretty sure this is the longest header I've ever written for a one of my blog posts. Don't worry, I won't make a habit of it. I wish I could remember who turned me on to the existence of this game, which was released in North America in April of 1993 as Great Greed. (Its Japanese launch occurred in September of 1992.) I know it was someone on Twitter, but that's all I can recall. At any rate, I'd like to extend a hearty "thank you" to that (at the moment) nameless, faceless person--should he or she happen across this post or any of its related social-media accompaniments. For those of you who've never heard of either version of this GameBoy title, it's a rather odd turn-based RPG that features, among other curiosities, a corrupt politician, pollution and a surprising number of characters, enemies and locations named after food. Actually, I'm not completely sure the above is true of the Japanese version as, duh, I can't understand much of its text at the moment, but it's certainly true of the North American version. Some of you probably are wondering right about now why I decided to buy the Japanese version of Great Greed rather than the English one. My response is pretty straightforward: the copy of Bitamina Oukoku Monogatari shown throughout this post set me back a whole $5. Also, I liked its logo, box art and overall pinkness. Have any of you played either Bitamina Oukoku Monogatari or Great Greed? If so, please share your opinions, if you're willing, in the comments section below. Also, let's chat a bit about how awesome it is that games like this are still getting released via retail--as opposed to only being sold digitally. 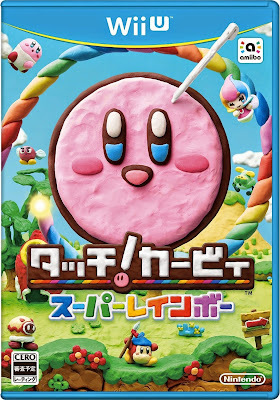 Speaking of which, copies of this absolutely amazing looking Wii U title will hit store shelves in Japan on Jan. 22 and in North America on Feb. 13--although European (and I'm guessing Australian?) store shelves won't be stocked until sometime in third or fourth quarter of 2015. The question is: will Western copies of Kirby and the Rainbow's Curse sport the same great cover art that was created for Touch! 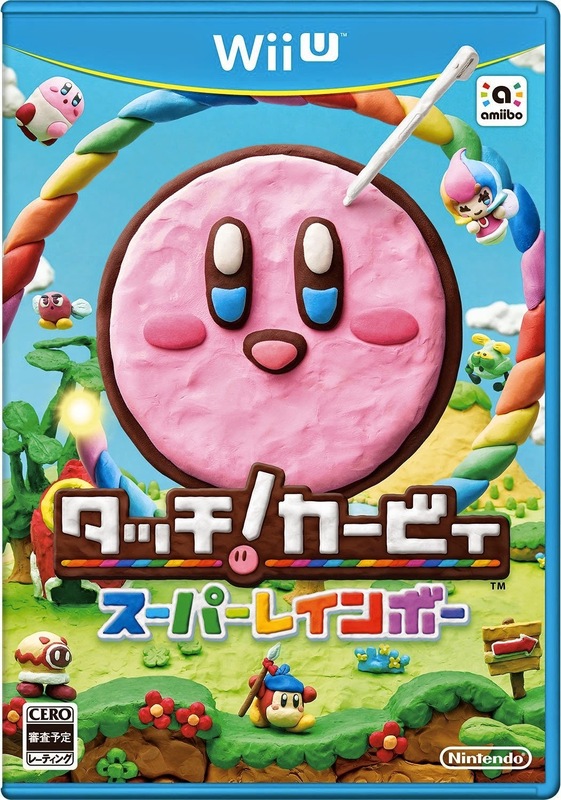 Kirby Super Rainbow (that's the Japanese version's name), or will Nintendo's European, Australian and American artists once again ruin everything by transforming this cuddly cover boy into "angry Kirby"?